Second week of January and, real talk, isn't it great that January 1 started on a Sunday? January looks so pretty when you view it as a month. I hope I used "real talk" correctly. I got to see a few friends on Saturday, and that's probably the last time I'll see them IRL until around April. But that's ayt, considering how much we all have to do between then and now. I'm going to be enrolled in three research subjects this term so that's definitely going to take up all my resources. I've gotten my old advisor for one of them, which is always great because I love her, and the doctor in charge of the lab I'm squatting at in the other campus has also graciously agreed to take me under her wing. I've only got one term under my belt so far, so it's kind of ridiculous to think that this time next year I should already be done with all my course work and research subjects and gearing up for comprehensive exams and orals. Not to mention my dissertation... MMMM. Anyway, I got to read a little bit more because I was sick for two days. I probably won't be able to get as much read in the next two weeks because I'm going to be preparing for this term's sampling as well as editing something pretty important. 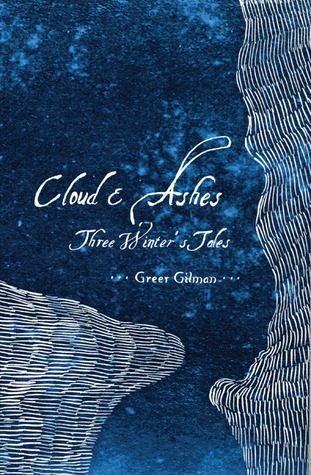 I'm eschewing all reading but Cloud and Ashes, which will help me finally finish this damn book. I've heard so many good things about it but I just can't get past the language right now. I have a lot of lining up to do in the next week so I figure that'll give me enough time to get through a sizeable chunk of it. I'm hoping that it'll hook me because I really don't want to lem a book so early in the year. I did however, knock a book off the Next 20s, which is always nice. I was looking through my Goodreads and old LJ posts to find out when I read Fulgrim, the fifth volume, and discovered that I'd read it in 2015. I'd completely neglected to read anything from The Horus Heresy in 2016. That doesn't bode well considering that the 42nd and 43rd books are coming out this year. 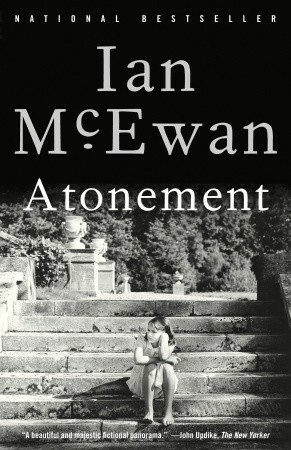 I didn't even mean to read Descent of Angels yet but I was in a (long) line for something the other day and I didn't want to read either of the books I should be reading (Gilman's confusing me and I refuse to begin on Atonement until I'm done with him). 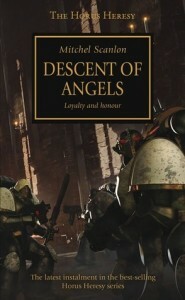 Unlike the previous HH books, DoA is set early on in the timeline, and deals with the annexation of a planet, Caliban, previously not part of the Empire, AND the discovery of a primarch. I was also surprised to find that the Emperor himself makes an appearance in this book. It's interesting for someone whose exposure to the Warhammer 40K universe is currently limited to the initial HH novels and Ciaphas Cain books to actually get to "see" the Emperor and the Great Crusade from the perspective of the Calibanites. Other than that though, I found the writing a bit repetitive and it didn't really grip me. How will I ever get through this series. The next one is written by Abnett, though, so that should be good. 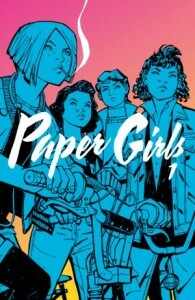 I started reading this in floppies when it first came out, but I lost track because of everything that happened, so I decided to take advantage of being sick yesterday and today and read through some graphic novel volumes that I'd missed out on. 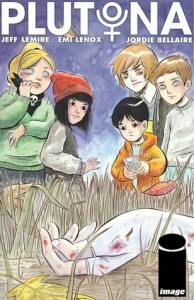 I was hoping that Plutona would be good, considering the way the initial issues set up so many interesting plot points, but I'm afraid that, over-all, it didn't live up to its promise or potential. I did enjoy it, but I couldn't help but feel sad that this was all it could be. I'm not sure if Plutona was really meant to only be five issues or if it was canceled before the writer could really get into developing his characters and story. It managed to rally in the last issue, but it was mostly weak. 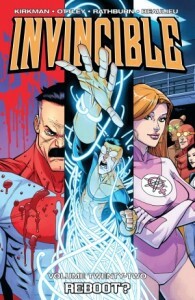 Invincible's supposedly ending on issue 144, which means that we've got 13 issues left in this 'verse. It's kind of mind-blowing considering how long it's been running, and how it's managed to remain fresh this entire time. I'm not really sure how Kirkman's going to end this series, but I think he's given himself enough rope to hang himself with space to really tie up a lot of the loose ends he's been dangling in front of us all these years. Volume 22 managed to bring us back to the beginning, a prerequisite for us long-time readers, just so we can see how far Mark's come, and how he's changed, both for better or worse, before The End. Read the first three issues before I decided to put it on the backburner and let the issues build up. Really a good decision, in hindsight, because there are two volumes out and it was so GREAT to read through both in one sitting. I was binge reading in bed this morning as I battled a stomach flu, and reader, I think Cliff Chiang's art healed me. 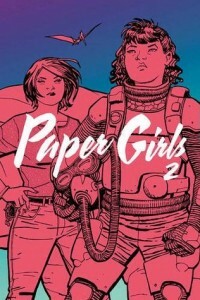 Vaughan's storytelling is still as good as it usually is, and it's kind of wild how he's managing to do such intimate character building with everything plot-related and timey-wimey going on (sorry to be salty, but this is what Plutona needed to do) and since this is BKV, lots of social commentary I'm not really sure where BKV is taking us but I welcome the trip.